The Caloosa Winnies of Southwest Florida were founded in 1970. The group was formed in South Fort Myers with 20 coach families joining before the charter was established. They were considered the charter members forming the group. To enjoy friendships, new adventures, and HAVE FUN! 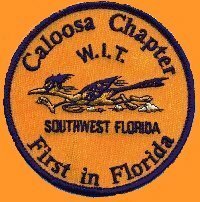 A circle logo inscribed with the name "Caloosa Chapter"; sponsoring organization WIT; emblem is the "Four legged roadrunner"; the area of the chapter activities: SOUTHWEST FLORIDA; and "First in Florida" acknowledging the Chapter as the first in the State. Normal outings are held the first full weekend in a month, subject to changes due to Holidays. Additional events may be scheduled as unofficial outings as decided on by the officers. https://www.caloosawinnies.org The site has a secure certificate. The WIT Club, Winnebago International Travelers, is the national organization based in Forest City, Iowa. The Caloosa Winnies are chartered under the WIT Club. To become a member of the Caloosa Winnies, if you are not a member of the WIT Club, the first step is to review their many benefits and membership information at www.witclub.com. You will be issued a WIT number and membership packet. Once you have applied to WIT you are welcome to join the Caloosa Winnies!